Mobile TV... will it or won't it hit the big time? 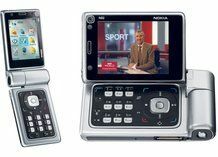 Analysts looking at the mobile TV market have said DVB-H, the standard found on devices like the Nokia N96, will become the standard in the future. And even more bizarrely, the same analysts have said that the format is actually bringing in money! Frost and Sullivan has published the results of a survey that says by 2010 DVB-H will be the unified standard for all mobile phones, and the industry will have reached €6.8bn (£5.4bn) by that point. It also said the operators offering the service will fund it through a subscription model, coming in at around £6-£10 per month. The fact there are many different mobile standards all over the world isn't helping the cause for TV on a small screen. It seems the notion of programming on your handset hasn't caught the public interest. But according to the firm, the format will take off later this year, with Nokia and O2 trialling UK DVB-H in the Oxford area already.